When designing a workplace, there are a number of facilities that, by law, need to be included. One of these is access to clean drinking water. While this may seem like an obvious and simple inclusion, there’s more to it than installing a tap. Safe Work Australia’s Managing the Work Environment and Facilities sets out a number of factors that need to be taken into consideration. According to Safe Work’s code of conduct, “an adequate supply of clean drinking water must be provided free of charge for workers at all times”. This supply should be positioned where it can be easily accessed by workers, and close to where hot or strenuous work is being undertaken to reduce the likelihood of dehydration or heat stress. Additionally, the water should be at or below 24 degrees Celsius, and supplied in a hygienic manner. For instance, workers cannot be forced to drink directly from a shared container. Aside from legal obligations, there is the recommended water intake to consider. US-based medical practice and medical research group, Mayo Clinic, suggests that men should drink roughly three litres of water per day. For women, the recommended daily intake comes in at just over two litres. But if research from Sodastream is anything to go by, the vast majority of people don’t achieve these hydration goals. According to their findings, approximately 80 percent of Australians suffer from symptoms typical of dehydration. 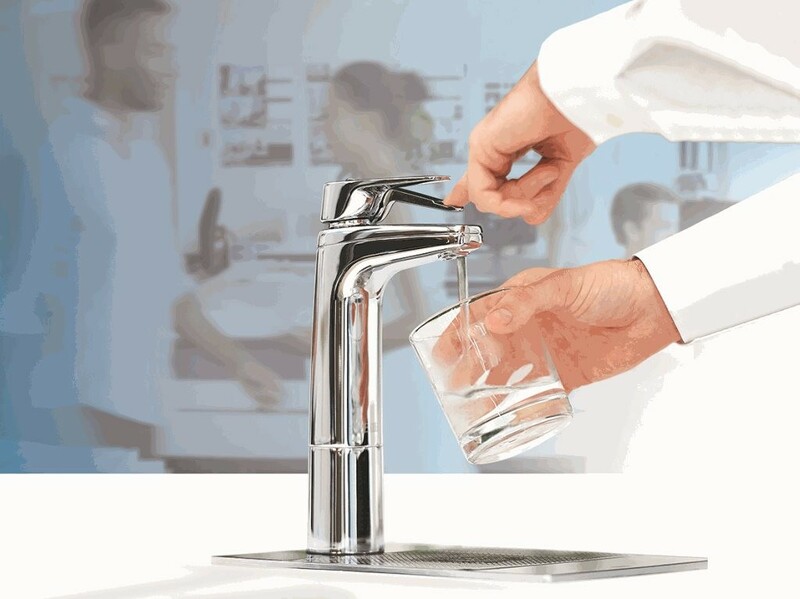 Though there are no shortage of options when it comes to providing adequate water to an office environment, the filtered water system – which achieves the magic trio of design, health and sustainability benefits – is becoming one of the more common solutions. Floorplans are often limited in an office environment, meaning design solutions must make the most of available space. This is where filtered water systems come into play. Unlike a stored supply of bottled water, filtered water systems are often reasonably small. They can be installed underneath or on top of benches. Billi’s Quadra range, for instance, has a small under-bench unit footprint and requires no ventilation. The product has been used extensively by the commercial fit-out and office interior design specialists at Concept Office Interiors – for instance, in their refurbishment of the United Energy office in Melbourne. “To complement our cabinetwork detailing and aesthetic, Billi is able to achieve a functional advantage by providing a water-cooled system, requiring no ventilation or clearance tolerance inside the joinery, nor grilles to the external,” says Grant Gifford, director at Concept Office Interiors. A filtered water unit does not just allow for higher quality water. It also allows for a great quantity of it. As an example, Rheem’s Aqua 5L 743005F has the ability to produce up to 170 cups per hour. Aside from initial installation costs and the occasional maintenance check-up, this increased quantity also comes at a much lower cost compared to the regular purchase of bottled water. But it’s the sustainability features of filtered water systems that really demonstrate their benefits. The most obvious of these is the ability to reduce an office’s environmental footprint by eliminating an overreliance on bottled water. This is particularly important when we take a look at the size of the bottled water industry, which the Australasian Bottled Water Institute (ABWI) estimates to be worth around $500 million per year. This equates to the sale of roughly 600 megalitres of water, 60 percent of which is sold in single-serve bottles. The production of bottled water has a significant impact on the environment. According to Clean Up Australia, it can take up to three litres of water to produce a single litre of bottled water. Most bottled water is packaged in PET (polyethylene terephthalate) plastic bottles. For every PET bottle produced, three tons of carbon dioxide is released. And then there is the issue of landfill. Australian consumer advocacy group, Choice, says that “less than half of these PET plastic bottles are actually recycled, with the remaining 60 [percent] going straight to landfill”. The sustainability benefits of filtered water systems aren’t just limited to the above. Many of the systems available on the market are additionally equipped with energy- and water-saving features. As an example, Billi’s heat exchange technology is designed to recover waste heat energy generated by chilling water and reusing the energy to preheat the boiling water. A standby mode also conserves power by powering down after two hours of non-use. Likewise, Zip Industries’ PowerPulse technology maintains stored boiling water to within 0.2 degrees Celsius of set temperature, meaning no water is wasted during the heating phase. Additional power-saving features allow Zip’s HydroTap to be turned off completely for periods of time, and automatic power-down or power-off control the device after two hours of non-use. A hidden light sensor also sends the appliance to sleep when the room goes dark. A filtered water system is one of several solutions to providing a workplace with clean drinking water. Beyond helping to meet the legal requirements for a commercial build, filtered water units come armed with a variety of features that assist in creating safer and more sustainable workplaces. These benefits are felt in the wider environment through less water wasted, and less plastic that is produced, utilised and ultimately discarded as landfill.